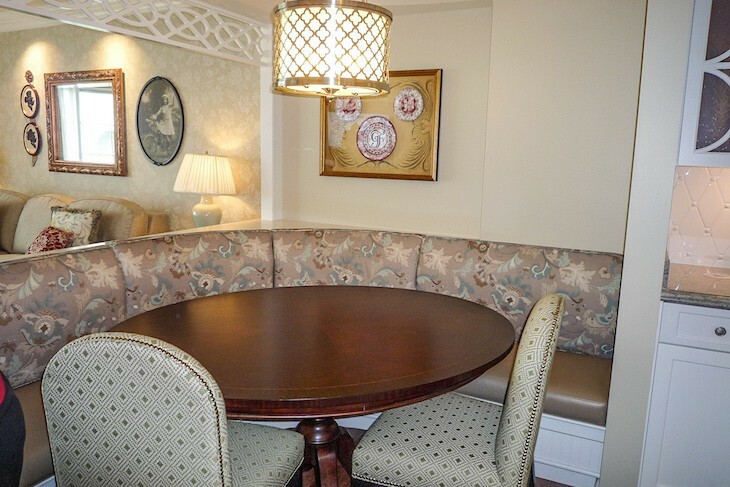 Sitting right next-door from Disney's Grand Floridian Resort & Spa with a perch on the shore of the Seven Seas Lagoon and the connection to Disney’s flagship resort, this is one popular choice for families wanting luxury combined with the convenience of a living area and kitchen but at a lower price tag than the Grand Floridian’s suites. 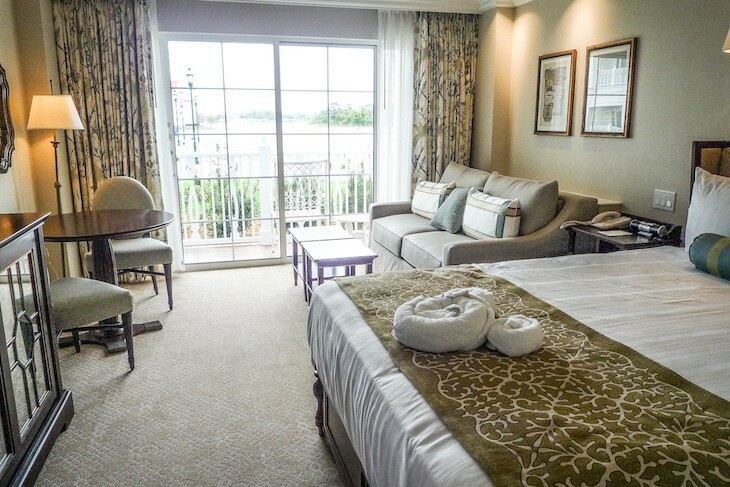 And better yet, guests will enjoy all the recreation and services of the Grand Floridian Resort & Spa. 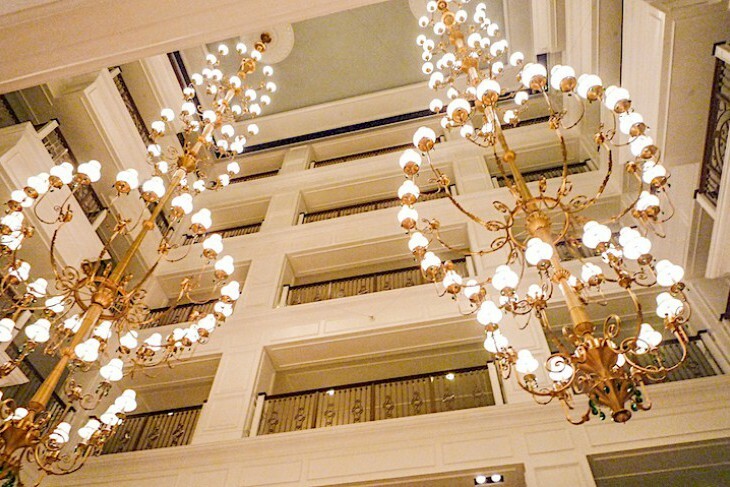 Built in the same casually elegant style as the next-door resort, inside the marble lobby is a soaring six-story atrium filled with Victorian grillwork and centered by a whimsical bronze fountain of frolicking penguins reminiscent of the Disney classic movie, Mary Poppins, while overhead are two massive antique brass chandeliers adorned with green crystals. In fact the entire lobby has a Mary Poppins theme found in the artwork, carousel horses, even an elevator hand in the form of Mary Poppins’ umbrella. Scattered seating lends itself to relaxation. One issue is that with no villa pool of its own, the Grand Floridian’s existing pools are a bit overwhelmed with both properties utilizing them. Although with only 47 studios, 47 one-bedroom villas, and 47 two-bedroom villas this is the smallest of the Deluxe Villa properties. Villas here are light and airy with white cabinetry and neutral décor accompanied by touches of soft blue, mint, and pistachio green wall color accents and furnishings. An iPod docking station, electronic safe, Blue-ray DVD players, iron and ironing board, Pack ‘n’ Play, coffeemaker, vacuum, hairdryer, robes, H2O Sea Salt bath products, and nightly turndown service are additional amenities included in each villa. 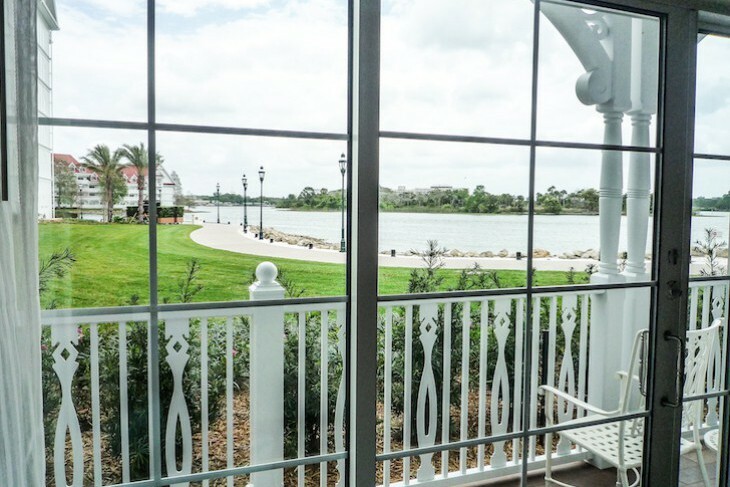 Villa view choices: Standard View one with a look at the front or side of the resort; or a Lagoon View with views of the Seven Seas Lagoon (and if you are in luck a distant view of the Castle). Studios are pleasant but they are a bit small at 374 square feet. Decorating the room is a queen bed topped with a soft white duvet and a pistachio green bed runner along with a cherry wood coffee table, two-person table with soft green upholstered chairs, a mirrored front bureau over which is a located a wall-mounted, flat-screen TV and inside of which is a fold-down single bed (with a Dumbo themed backdrop), and a taupe sofa sleeper. A mini kitchen has a sink, undercounter refrigerator, and microwave. 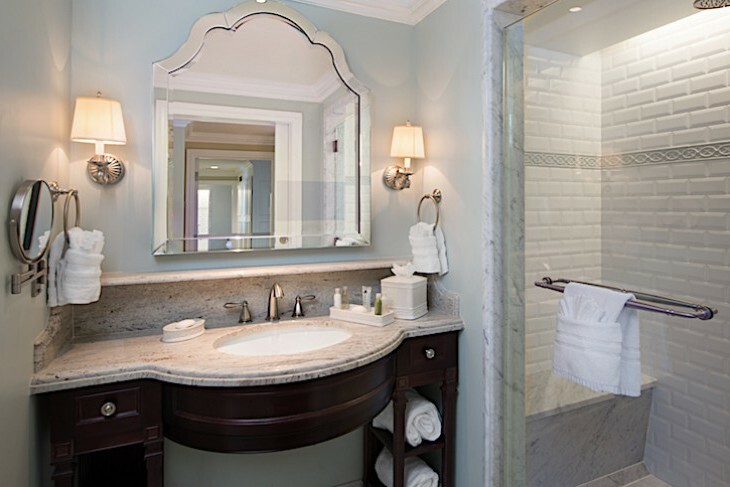 The bath has two areas, both accessed from the entry hall: on one side is a white tiled tub/shower and commode; the other, separated by a pocket door, holds a single sink with a Magic TV built into the bath’s mirror, and a shower with both hand held and rain showerheads. A balcony adjoins the studio (first-floor units come with a patio instead). 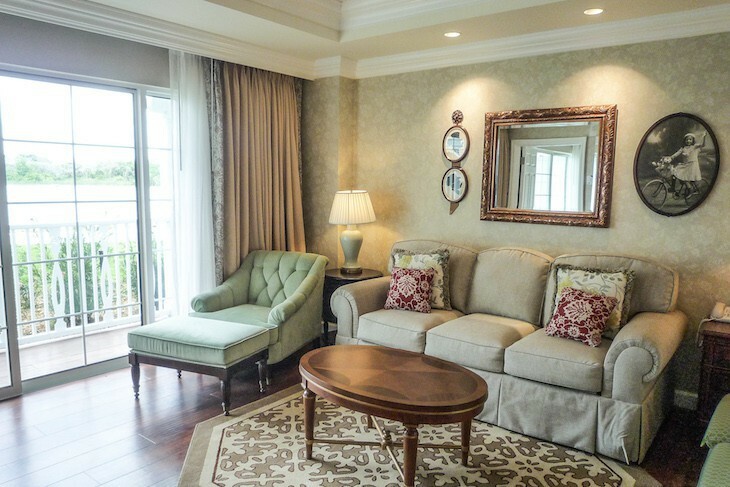 Accommodates up to five guests plus an infant. One-bedroom Villas are 844 square feet. Enter straight into the kitchen where an open floor plan and hardwood flooring adds to the feeling of a larger space. The full kitchen has white cabinets with glass upper doors and a panel-covered refrigerator and dishwasher. 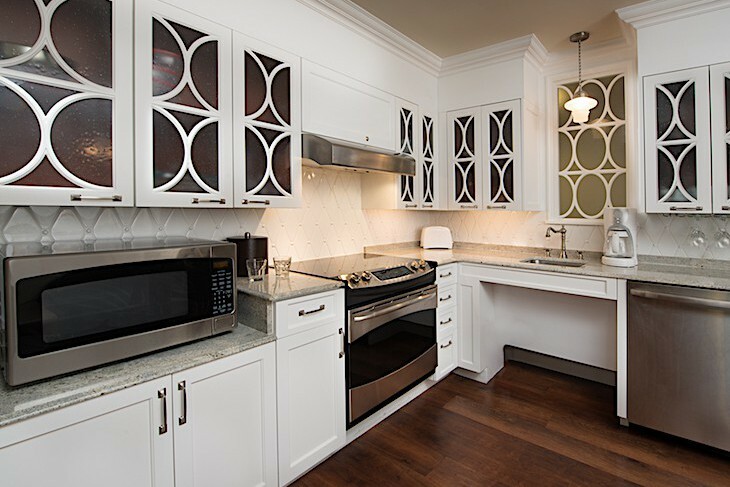 Featured are light gold granite countertops, white tile backsplash, and a farmhouse sink. A curved booth-style dining area upholstered in floral and leather fabric adjoins the kitchen. The living area, open to the kitchen, is furnished with a taupe sleeper sofa, mint green easy chair, coffee table, and an entertainment wall over which is mounted a flat-screen TV and where underneath can be found a foldout single bed with a Mary Poppins backdrop. The cream on white wallpaper is reminiscent of the Victorian age. A sliding door leads to a balcony or patio also accessed from the bedroom. Off the foyer is a full-size bonus bath with a smallish corner single sink. You’ll also find a stacked washer/dryer in the hallway. In the bedroom is a king-sized bed with pistachio green tufted headboard, white duvet, and a soft blue and green floral bed runner accented with a chocolate brown bolster pillow. Two round side tables flank the bed, a powder blue easy chair sits in the corner, and there is a nice-sized walk-in closet with electronic safe. Above the cherry wood bureau is a flat-screen TV beside which sits a desk and chair. The master bath’s white and black marble flooring definitely harkens back to another era as does the freestanding tub. One area of the bath holds the tub and a single sink set in a marble vanity as well as a Magic TV built into the mirror; the other area holds the commode, an additional sink, and a sizeable white brick-style tile shower with rain showerhead (also accessible from the villa’s entry hall). Accommodates up to five guests plus an infant. A Two-bedroom Villa is simply a combination of the One-bedroom and a Studio at 1,232 square feet. Some are dedicated units with the second bedroom offering two queen beds and no mini-kitchen. Accommodates up to nine guests plus an infant in a dedicated two-bedroom, and up to ten guests plus an infant in the two-bedroom lock-off villas because of the addition of a sleeper chair (preference is on request only). 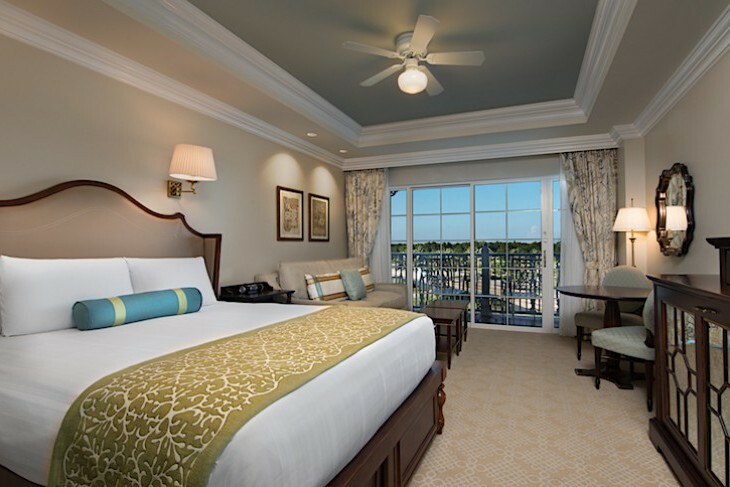 With 2,800 square feet spread over one story the Grand Villas are the largest in Disney’s villa repertoire and quite the luxury. In the oval entry hall is gold floral wallpaper, a definite Victorian touch. The large open living/dining area has parquet flooring with two cream-colored, cushy sofas and a large coffee table along with a giant flat-screen TV found above a yellow entertainment center. The dining table is massive seating twelve over which hangs a chandelier with crystal touches. Near the dining area is the full-size kitchen with white glass upper cabinet doors, oversized refrigerator, stove, dishwasher, microwave, and farmhouse-style sink, and at the kitchen bar are three stools for counter dining. Off the entry hall to the master bedroom is a TV room with a long, cream-colored sectional sofa fronted with a row of small cocktail tables. An entertainment center with a large flat-screen TV and loads of cabinet space covers the opposite wall. Across the hall is a 4th full bath with single sink and shower. The master bedroom features a curtained king bed with bench seating at its foot, and the parquet flooring is covered with a soft floral area rug. A wood and mirrored armoire holds another flat-screen TV and beside it sits a desk and chair. The master bath has marble flooring and a marble vanity with two sinks over which you’ll find a large glass framed mirror boasting a Magic TV. In an alcove is a sizeable whirlpool tub, and a large shower with rain showerhead is tiled in white. The commode is in a separate area. On the opposite side of the villa are two bedrooms, each with two queen beds with soft blue tufted headboards, white duvets, and red bed runners. Each have a desk and entertainment armoire with flat-screen TV as well as a single-sink, tub/shower combination bath, one of which is located outside the guest room in the hallway. And each bath has a Magic TV built into the mirror.